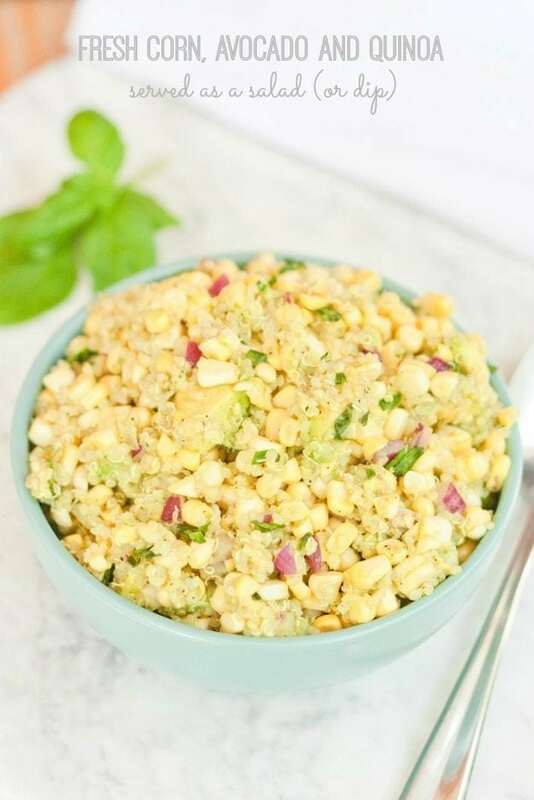 A delicious quinoa salad with corn, avocado, basil and fresh lime juice. Perfect for summer and can be served as a salad or as a dip! Vegan + gluten-free. 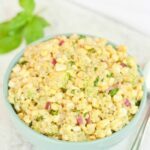 I’ve been making my raw corn and avocado salad for years. It’s really easy to toss together, requires minimal ingredients and is always a hit at parties. It’s one of those recipes that I know by heart and could probably make in my sleep in needed. <– Not sure when that will be necessary (probably when we have kids), but I think it’s good to have a few recipes like this in your back pocket. Last weekend we were going to a little get-together on Saturday night so I made a batch of the salad to bring along. But this time I switched things up a bit. I used less corn and added in quinoa. I’ve made plenty of quinoa salads before so I knew it was going to work but it turned out to be more delicious than expected. 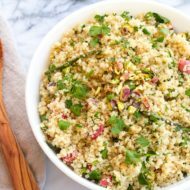 The quinoa added a nice addition to the texture and a little protein without changing the flavor of the salad. Love! 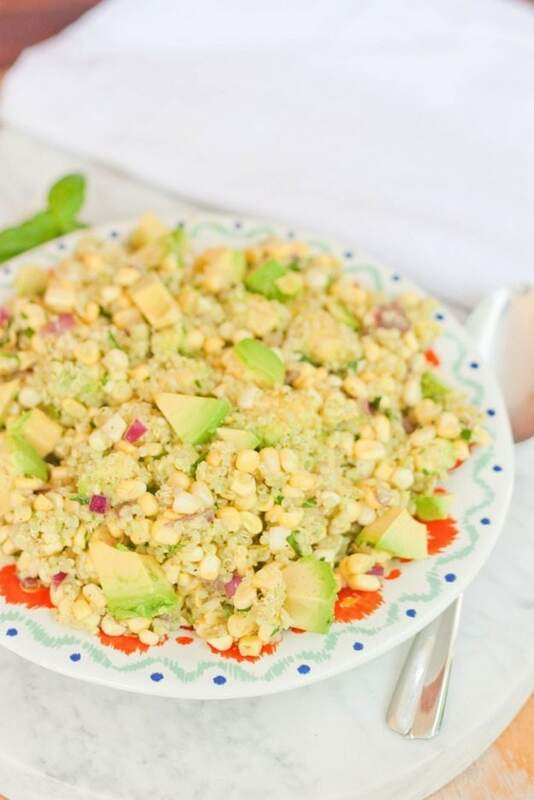 This quinoa salad with corn and avocado might just become my new go-to. Interestingly enough, I usually serve this as a side salad at potlucks but at the party last weekend people started dipping chips in it and calling it a dip. Hey, I’ll take it — I’m all about versatile dishes! I tried it with a chip and it definitely works. It’s like a corn and avocado salsa. So.. if you happen to be looking for an easy, no-cook recipe to make for your next shindig, here it is! Bring utensils and serve it as a salad or bring chips and serve it as a dip. Either works! Enjoy. 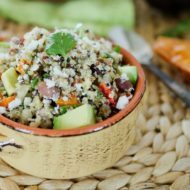 Love quinoa salads? 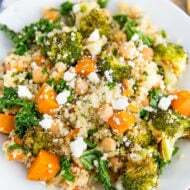 Check out my roundup of other healthy quinoa salad recipes. 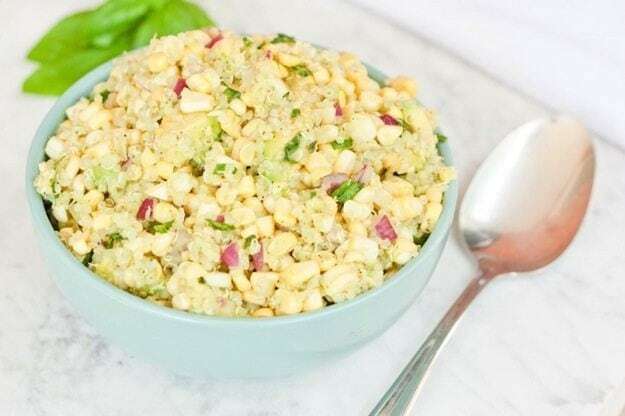 A delicious quinoa salad with corn, avocado, basil and fresh lime juice. Perfect for summer and can be served as a salad or as a dip! Cook quinoa according to package directions. Place in a mixing bowl and put in the fridge to cool. You can even do this step the day before. Just store the cooked quinoa in the fridge until you’re ready to prepare the salad. Husk and cut corn from the cob (here’s a quick tutorial), pulling out as many corn silks as possible. Combine all ingredients in a large bowl. Mix well. Serve immediately or allow to marinate for a few hours before serving. Do you have a go-to dish that you’ve made so many times you no longer need the recipe? Any big plans for the 4th of July? We’ve excited to be spending the weekend with my Aunt, Uncle and cousins in North Carolina again this year. Can’t wait! You are rocking with all of the fresh salads lately!! This sounds AMAZING, especially with fresh sweet corn! Ohhh this sounds delicious! I love sweet corn like this! My potato salad is typically my go-to, no recipe thing to make. However, now that I know I have an onion sensitivity, no more potato salad for me (it’s just not the same without it). Do you think this salad would be OK without the onion? Oh boo! I think it would be okay without the onion. I’m curious, how did you find out that you have an onion sensitivity? Oh yeah, I bet that feta would taste delicious in it. You’ve got me drooling with this recipe! It looks so good and perfect for a bbq, which means I’ll have to make it soon. PS: I made your Kale salad and it was glorious! This looks sooooo good. Can’t wait to try it out this weekend. I have a protein pancake recipe that I’ve made probably 1000 times and never need the recipe. Anyway, this dish looks amazing! Definitely worth the time to make since it looks so tasty and it’s so beautiful. I love quinoa, so this is right up my alley. I usually just whip up some guac or a chunky corn, bean, jalapeno, cado type salsa. There are so many party foods I just love for summer! Oh and fruit shish-kabobs! This recipe is delicious, very tasty! Sometime I avoid serving quinoa because it doesn’t have much taste (if you don’t prepare it a good way). This salad is one of my favorite meal for lunch breaks at work. This looks amazing! I am definitely going to be trying this out for the 4th! Thanks for the idea! I ended up making it for the 4th after all and everyone loved it! This salad just screams summer! I LOVE corn and it’s really one of my favorite things about summertime haha 🙂 This is perfect! Delicious! Such a great salad. Thanks for sharing! New to the blog but I am so glad I found this recipe! Sounds amazing! Welcome Elise! I’m glad you found me. I made this last night an it was SO good! My guy said “nice combinations of taste”, and then he asked “Is that corn RAW?” Anyway it was fantastic for lunch today too. I entered it in Myfitnesspal. Thank you for another great recipe! Woo-hoo! So glad that both you and your man liked this recipe. It’s one of my favorites. Woot! I LOVE this salad so much. I would never think of combining these ingredients,and it turned out SO tasty! Thank you for sharing! Yay!! I’m so glad that you enjoyed it, Lena! !